Find able-bodied fellow adventurers to go on a discovery mission. That process became more complex and exciting in 2011, after a guide-outfitter reported tracks way into the mountains, in rocks much older than those around Tumbler Ridge or in the coal mines. A whole new series of canyons and summits needed to be systematically explored for tracks. The results have included the spectacular trackways on a huge vertical surface in Dinosaur Gorge, some of the oldest known bird trackways in “Tim’s Creek”, and, as reported in Tumbler Ridge News in August, new tracks in what came to be called Emperor Creek (so named because of its relation to the top runners in the Emperor’s Challenge). There was yet another creek I was aware of, that I had explored long ago in pre-TR-dinosaur days, when I was looking for rock climbing areas. Therefore I knew about substantial rock exposures in this canyon, and they seemed to be of the right age. All I required was a willing co-adventurer, and Bryan Recoskie, who was doing a locum in the medical clinic in August, was enthusiastic, especially when baited with the possibility of being shown a remote fishing hole on the way back. Wading through a river, mountain biking old exploration roads, and transiently getting lost set the scene, before we entered the canyon and scoured the multiple potential rock surfaces. For a long time, we found absolutely zilch, just one old empty beer can to let us know that civilization had preceded us. Just when we were running out of rock and were almost ready to turn around, fearing we might have been skunked, we noted a suspicious-looking rock surface in the forest above us. Then came the thrill and privilege of knowing that no human eyes had appreciated what we were about to experience. The shadows outlined the unmistakable patterns of trackways, except… these seemed a bit different: big, but with very widely splayed toes. 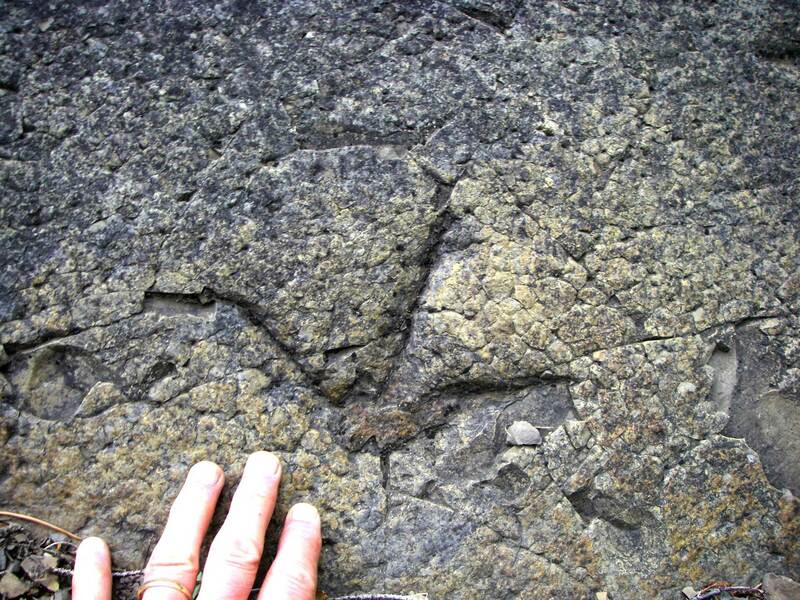 Could these be bird trackways, different than any that had previously been encountered on the continent? Next steps: take numerous photos, get a GPS reading, write a trip report and present it to scientists Rich McCrea and Lisa Buckley of the Peace Region Palaeontology Research Centre in Tumbler Ridge. But first we had to return the way we had come, and that is when Bryan somehow succeeded in getting stung by a bunch of bees. The sting score: Recoskie 9, Helm 0. Recoskie not allergic, Helm allergic, hence both docs survive to tell the tale. Recoskie then gets his priorities right by ignoring the significant swelling of multiple stung body parts in order to focus on catching a few grayling on the way out. There is nothing quite like talk of fossil bird tracks to get Lisa Buckley excited, as her area of special interest is the birds that co-existed with the dinosaurs and left their tracks behind. So that night Rich and Lisa spent till well past midnight analysing the photos in minute detail. Soon they were visiting the site, taking hundreds of photos to eventually process into 3D photogrammetric images, making replica moulds with museum-quality latex, and taking museum volunteer Brandon Braam with them to check on inaccessible rock surfaces with his famous drone. With them went another volunteer, Paul Nesbitt, providing valuable help and only getting three stings in return for his efforts. Birds or dinosaurs… either way, the answer will be exciting and valuable, there will almost certainly be a new McCrea & Buckley research article, and replicas and interpretation of these new trackways will be on display in the Dinosaur Discovery Gallery – one more item that may elicit a sense of wonder and awe in visitors who may come to enjoy the Tumbler Ridge Global Geopark. Such ongoing activities help cement the reputation of the Geopark as an active area of discovery and cutting-edge research. Many of our creeks are still unnamed. This is part of the joy of living in a frontier region where there is still so much to explore and discover. For the purposes of dinosaur tracking and ease of reference, however, each creek with such fossils requires an unofficial name. Ninesting Creek it is, in honour and celebration of Bryan Recoskie’s near-martyrdom in the cause of science.